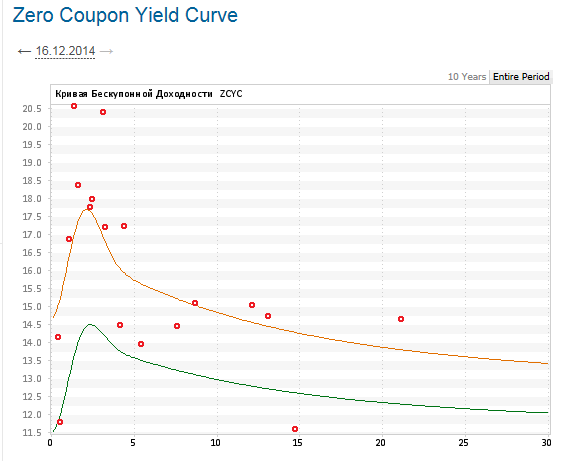 The russion CB hiked the policy rate tonight form 10.5% to 17.0%. In the market this lead to a nearly parallel shift of the yield curve with steepening in the 1-5 year range. 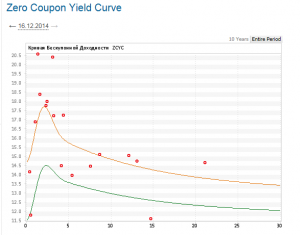 How large is the duration mismatch of the Russian banks? Assuming it is not trivial, how long will the banks survive the inverted yield curve? The macro problems of Russia show all the symptoms of dutch disease – a strong ressource sector leading to real appreciation of the Ruble, making the rest of the economy less competetive. The current abrupt reversal following the decline in oil prices kills the forex inflow on which domestic consumption of imports relied, making the interest rake hike necessary. This finally kills investments in the private sector, which would be necessary to capitalize on the new terms of trade by increasing exports and consumption of domestic goods. PS: Gone with the wind – after gaining 10% in early trading after the hike, the ruble lost all gains before lunch.